CLEARFIELD – GANT Media LLC is pleased to announce it has built a news bot to deliver local news and top stories to its readers faster via Facebook messenger. The bot will help readers stay on top of breaking news and other stories they care about the most. It will deliver information in a convenient and engaging manner to readers through a private Facebook message. The new bot project is a part of GANT’s ongoing effort to deliver credible and accurate news to its readers in a timely fashion. 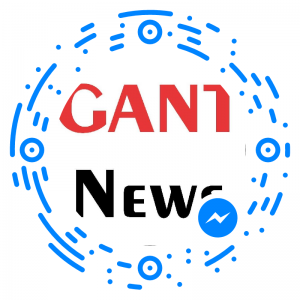 GANT News currently has 8,300-plus Facebook followers, and with the bot, readers will be able to receive notification of breaking news instantaneously and not have to wait for important headlines to be shared by friends or to appear in their news feed. (Pictured above is a sample bot message that users will receive as a private facebook message). Readers who subscribe to the bot, called “GANT Big Stories,” will receive a morning message with that day’s top headlines. Then, if a story develops, the bot will alert readers to the breaking news. Readers will also be able to interact with the bot and suggest news stories to GANT. In addition to the “Big Stories” bot, GANT News has built a bot that will solely relate news information regarding to the proposed Clearfield-Lawrence consolidation plan. GANT is the first local news organization to embrace the use of “artificial intelligence.” The new technology will enable GANT to deliver news faster while also engaging with readers. While its news bot project is still in its infancy, GANT Media will continue research and has plans to build a “more intelligent” bot. The goal is to create an engaging experience in which users can converse with the bot to narrow down topics and receive news of interest to them. 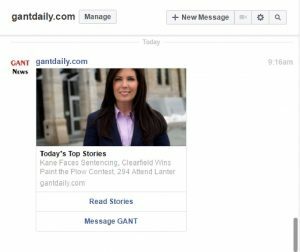 Like all of GANT’s services, the news bots are free to readers and supported through local business advertising. In the near future, GANT will have opportunities for businesses to sponsor bot messages. This will create a non-intrusive and unique advertising platform for them. Read further for more information on GANT News bots. A bot is a computer program designed to simulate conversation with human users over the Internet using artificial intelligence. What are the benefits to using a GANT News bot? If you are a Facebook user, you will have the ability to receive instant messages on local, breaking news. You will no longer have to wait for the information to be shared by friends or to appear in your news feed. If you do not have a Facebook account, you can still sign up to receive breaking news alerts delivered through e-mail. Yes. All of GANT’s news services are provided free to the public. How do I subscribe to GANT’s Messenger bots? Can I opt out once I subscribe? Yes. You can simply log on to Facebook messenger and click on the link to remove the desired bot. JUST IN: Burn Ban Lifted in Lawrence Twp.